MTN YAFUN YAFUN CASH PROMO. 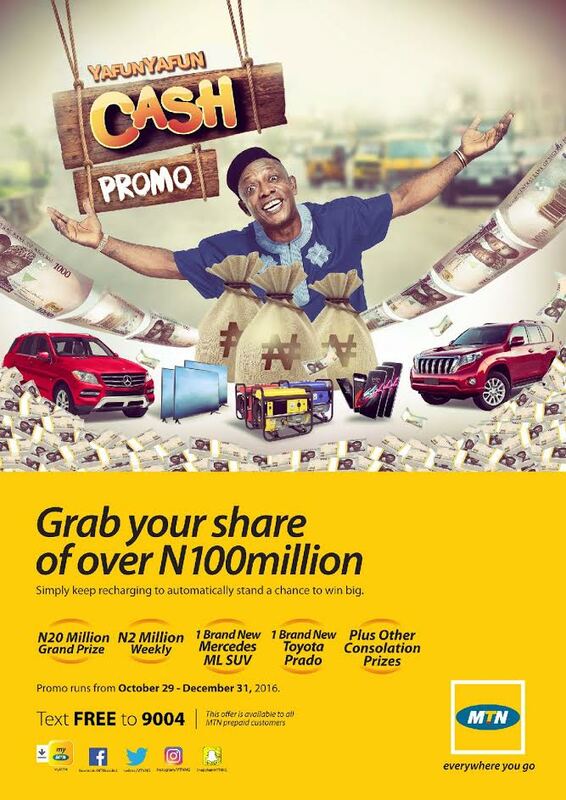 TEXT FREE TO 9004, WIN YOUR OWN SHARE OF OVER N100 MILLION NAIRA. Yafun Yafun cash promo is an SMS subscription based service that allows you to collect points towards prize draws simply by topping up your balance and playing a free trivia game. The more top-ups you have (in value and frequency) the more chances you have to win higher value prizes. At the same time you can also enjoy premium based trivia game where you can opt in for various higher value prizes, and another two content services offering dedicated prizes for promotional purposes for a specific period of time. Top up rewards (Free level) – MTN subscribers who top up and send the communicated Keyword become participants and can collect points by topping up and by answering to questions on trivia game points. Points accumulated correspond to entries to draws for various prizes. Premium Trivia Service: Premium Trivia Game under daily subscription cost of N100 (inc. VAT), involves a set of questions and answers. Participants can compete for Premium Level Prizes. Premium Loop (Celebrity Content): Premium celebrity content-Davido-under daily subscription of N50 (inc. VAT), involves local celebrity content such as Never-before-seen material & direct feed from top celebrities. Content will be available over a mobile app, web based or SMS based depending on the user device. Subscribers can compete for prizes for a limited period (Program period). Subscribers to the service will continue enjoying the service even after the end of the Program Period. Premium Fitness clues (content service): Premium fitness clues under a daily subscription of N30 (inc. VAT), offering fitness information via SMS and a mobi-site that offers rich content. Subscribers can compete for prizes for a limited period (Program period). Subscribers to the service will continue enjoying the service even after the end of the Program Period. Flat Screen TV and lots more. Every day, paid level users are charged via the daily billing cycle that runs while a subscription is active. Promo Started on 27th October, 2016 to end on 31st December, 2016.